The terms and conditions that we supply products listed on our website are set out below. Please read these terms and conditions carefully before ordering any products. 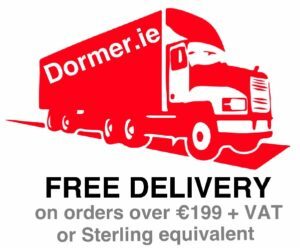 By ordering any products on Dormer.ie you agree to be bound by these terms and conditions. The owner of Dormer.ie (“this website”) is Dormer (Ireland) Limited whose registered office is Brewery Street, Castlebellingham, Co. Louth, Ireland A91 PW42. Registration number 15931. All issues regarding this website, including Terms and Conditions, is governed exclusively by Irish law and subject to the exclusive jurisdiction of the courts located in the Republic of Ireland. You must be eighteen years old to use this website. If you are under eighteen years old you may only use this website with the consent and under the supervision of a parent or guardian. If you do not qualify please do not use this website. By using this website you understand that you are financially responsible for all use of this website and those using your login information. Your contract for purchases made through this website is with Dormer (Ireland) Limited, and you undertake that any and all goods by you are for your own use. Once you have submitted and paid for your order you will receive an email headed ‘Thank you for your order’ recognising receipt of your order. We will then send a further email headed ‘Your order is complete’ when you order has been processed and this usually indicates your order has been shipped. If we have to cancel all or part of your order for any reason, we will email you to let you know and confirm that a full or partial refund has been made to you. We may unintentionally publish inaccurate information on the site for example price, description or availability of the product you have ordered. When this happens we may have to cancel your order at any time up to the point we send you the product(s), even if you have received ‘Your order is complete’ email, and you will receive a full refund of any charges already paid. Unfortunately, we cannot guarantee that products advertised on this website are available. If we do not have all the products you order in stock we may offer you alternatives which you may choose to accept, or you can cancel all or part of your order. If you have paid for an item that is out of stock you will be issued with a full refund. In addition, we sometimes change product specifications or withdraw product lines. We accept no responsibility if we are unable to supply products ordered as a consequence. Please read our returns policy before making a purchase with us to ensure that you have a clear understanding of our refund policy and whether you have a right to cancel your contract with us. Click here to read our returns policy. If you think there is a fault with a product please contact us immediately at info@dormer.ie We may ask for the goods to be returned or ask you to carry out a telephone diagnostic with one of our experienced members of staff. Should the fault occur within 14 days from the date of delivery you have the option of a full refund or an exchange. Prices on this website are shown excluding and including Irish value added tax. If you are located in the UK and provide us with a valid UK VAT number we will not charge you VAT. As a lot of products are listed on this website and it is possible that, despite our best efforts, some of the products may be incorrectly priced. Prices will normally be checked as part of the dispatch process. Where it is found that the correct price is less than the stated price you will be charged the lower amount and a refund of the difference will be issued within 30 days. Where it is found that the correct price is more than the stated price you will be contacted before the products are dispatched with instructions on how to pay the difference. You may cancel the order if you wish, otherwise goods will be dispatched once the additional payment has been received in full. We are under no obligation to dispatch products to you at the incorrect lower price, even after we have sent you a sale confirmation email, if the pricing error is obvious and unmistakable and could reasonably have been recognised by you as an error in pricing. You can choose to pay in either Euro or Sterling. Any information on this website in relation to exchange rates are approximate only and may vary from time to time. Banking charges by the receiving bank on payments to us will be borne by us. All other charges relating to payment in a foreign currency will be borne by you. Payment is taken once the order is submitted and you can pay using Visa, Laser, MasterCard, PayPal or by bank transfer. You must pay us the full price of your order before we will send any part of it. We use identity checking to protect you and detect and prevent fraud. As part of our security checks we may phone you to verify your details and your identity. We at Dormer (Ireland) Limited respect your right to privacy and comply with our obligations under the Data Protection Acts 1988 and 2003. Please click here to read our full Cookies and Privacy Policies. We can deliver all products to anywhere in the Republic of Ireland or UK with the exception of island locations. We use a courier service to make deliveries and we aim to have your product delivered within 5 working days from date payment is received in full. Delivery is 5 days a week, Monday to Friday, usually between 9am and 6pm. We may deliver products in instalments if they are not all available at the same time for delivery. Ownership of products will only pass to you when we receive full payment for the products, including any applicable delivery charges. We always try to ensure your order is delivered to you complete and in working order. If for whatever reason you don’t receive all your order at once, you can check that they have been correctly dispatched using the tracking facility that will have been emailed to you. If for some reason you have not received this tracking facility please contact us at info@dormer.ie If you think your order is damaged then you must contact us within 24 hours of receipt of delivery at info@dormer.ie Please also follow the instructions outlined above for faulty goods. There is no manufacturer’s warranty provided on any products on this website. Dormer (Ireland) Limited and our suppliers own the copyright, trademarks and all other intellectual property rights in all material and content on this website, which you may use, download, copy, publish, transmit or otherwise make available by any other means only for your own personal, non-commercial use. Any other use or reproduction of the material or content is strictly prohibited. You agree to indemnify us against any claim or demand, including reasonable lawyers’ fees, made by any third party due to or arising in any way out of your use of this website, your posting any material, or the infringement by you, or by any other person using your computer, of any intellectual property or other right of any person. You are entirely responsible for any and all activities that occur under your account that is provided on Dormer.ie. You agree to immediately notify us of any unauthorised use or any other breach of security. By using this website you agree to accept responsibility for maintaining the confidentiality of your account and password. We make every effort to ensure the accuracy of information on Dormer.ie but the information on this website is provided ‘as is’ or ‘as available’ and without warranties or conditions of any kind either express or implied. We do not warrant or represent that the use of the results of the use of the materials available through Dormer.ie or from third parties will be correct. We accept no liability in relation to any of the above other than as may be provided under you statutory rights. We reserve the right to refuse you access to this website. You will not use this website for spamming which includes the sending of unsolicited messages, or the sending of unsolicited emails to either Dormer (Ireland) Limited or any of our customers. We will do our best to maintain this website in order that you have constant use, but there will be times when your use may be interrupted. By using this website you agree that you will not, and will not allow any other person to violate or attempt to violate any aspect of the security of this website. You understand that any such violation is unlawful in many jurisdictions and that any contravention of law may result in criminal prosecution. We give no warranty and make no representation, express or implied, as to the adequacy of appropriateness of products for your purpose. Our website may contain links to other internet websites outside our power and control. By using this website you accept that we will not be liable in any way for the content of any such linked website, nor for any loss or damage arising from your use of any such website. We are not liable in any circumstances for special, indirect or consequential loss or any damages whatsoever resulting from loss of use, loss of data or loss of revenues or profits, whether in an action of contract, negligence or otherwise, arising out of or in connection with your use of this website or the purchase of goods. In any event, including the event that any term or condition or obligation on our part (“Implied Term”) is applied into these conditions by law, then our liability is limited to the maximum extent permitted by law, to the value of the goods or services you have purchased. We reserve the right to terminate at our sole discretion your account on Dormer.ie for violation of the letter or spirit of these terms and conditions. We also reserve the right to terminate this website at any time. In addition we reserve the right to amend these terms and conditions from time to time.